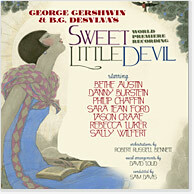 George Gershwin's long-lost musical, 1924's Sweet Little Devil, receives its world premiere recording, as PS Classics continues its acclaimed Forgotten Musicals series. 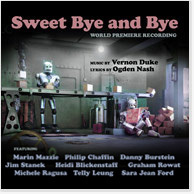 Featuring lyrics by George's then-regular collaborator, B.G. (Buddy) DeSylva - with whom he penned such early hits as "I'll Build a Stairway to Paradise" and "Somebody Loves Me" - Sweet Little Devil, George's earliest surviving score, reveals Gershwin's gift for memorable melodies already in full flower, and hints at the driving rhythms and bold blues notes that would characterize his later work. During the Broadway run of Sweet Little Devil, George premiered his Rhapsody in Blue, forever changing the course of his career, then forged a lifelong partnership with his brother Ira; DeSylva went on to join Lew Brown and Ray Henderson on some of the Great White Way's merriest entertainments, including Good News and Flying High. 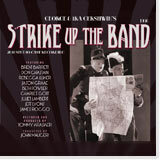 Now, a cast of Broadway veterans - including Bethe Austin, Danny Burstein, Philip Chaffin, Sara Jean Ford, Jason Graae, Rebecca Luker and Sally Wilfert - join conductor Sam Davis and vocal arranger David Loud in bringing this forgotten Gershwin gem back to life with its original Robert Russell Bennett orchestrations. PS Classics invites you to enjoy the genius that is George Gershwin, at the moment when he was finding the musical voice that would come to define him. Hey! Hey! Let 'Er Go!